Earlier this week, a pilot whale died after being found with 17 pounds of plastic bags in its stomach. The horrific incident was our latest reminder that plastic bags contribute to the scourge of marine litter. By sheer coincidence, it came on the heels of a major U.N. report pointing to plastic bag levies or bans as key strategies to help reduce that litter. Many seem to be listening. 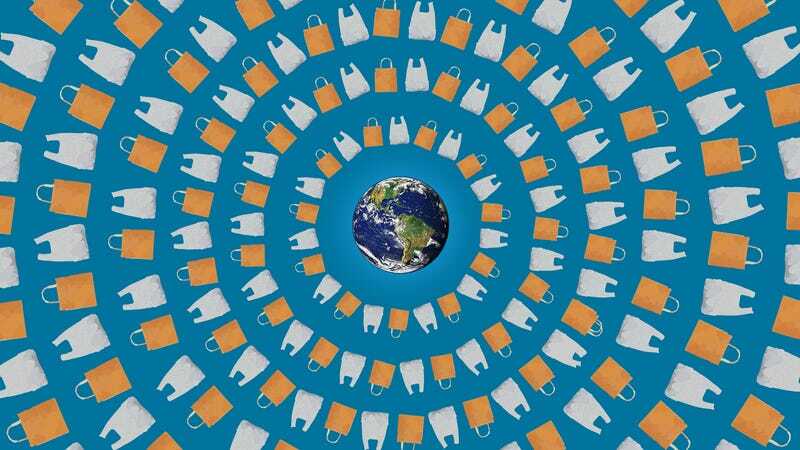 But as the war against plastic bags intensifies, it’s worth taking a step back and asking: How much better are the alternatives? The assumption is that the hierarchy of sustainable choices goes reusable totes, paper, and plastic. While that may well be true from a litter perspective, when it comes to emissions, energy and water use, smog, and a host of other factors, it turns out paper and totes often fall behind good ol’ petrol-borne plastic. A key method used for determining the sustainability of a product is the Life Cycle Assessment. LCAs analyze all the steps (resource extraction, manufacturing, shipping, use, disposal, etc.) in a product’s long journey from factory to landfill, and calculate what impact each has on things like greenhouse gas emissions, resource depletion, the degradation of water bodies, smog production, and the creation of toxic byproducts. Next to no LCAs peg the plastic bag as a slouch. Generally speaking, there are two main types of grocery bags: Low-Density Polyethylene (LDPE) and High-Density Polyethylene (HDPE). An easy rule: thick, glossy bags like the ones you get at department stores, are usually LDPE. Thinner grocery bags are probably HDPE. One recent LCA by the Danish Environmental Protection Agency, which compared 14 types of bags and analyzed their impact in 14 categories, concluded that the most sustainable choice was to use LDPE bags, and reuse them as trash bags. To match LDPE bags in climate impact, cotton bags would have to be reused 52 times—149 times if it’s organic cotton. (That may sound strange, but organic crops can require more land and resources to grow.) To compete with plastic in every LCA category, regular cotton bags would need to be reused 7,100 times, and 20,000 times for organic cotton. Paper bags would’ve needed to be used 43 times to compete. Why does plastic come out ahead? For one reason, plastic weighs less than paper or cotton, and carries more for the material it uses. In fact, to compensate for the discrepancy in carrying capacity, one LCA by Hong Kong Polytechnic University researchers compared two plastic bags to every one paper bag, and still found plastic bags took less energy to make. Paper bags also produced nearly four times more solid waste, 142 percent more air emissions, and 15 times more water-borne waste. The staggeringly high number of times cotton needs to be reused is attributable in part to the fact that its lifecycle can create ozone-depleting byproducts, according to that Danish study. But even ignoring ozone, organic cotton bags may need to be reused up to 3,800 times to match LDPE. Another LCA from the UK Environment Agency analyzed the global warming potential of different bags per their carrying capacity, and compared its results to three other studies’. In all but one study, HDPE bags came out on top. In that paper, as with others, the weight of the bags was a dominant factor. Even heavier-but-biodegradable plastic bags were determined to be less sustainable than using regular plastic as many times as you can, before using them to take out the trash. Granted, the UK study assumed bags used in Europe would be recycled all the way in China, which could explain why recycling didn’t improve the bags’ sustainability more. This underscores one issue applying the results of any single LCA study to your situation: No two countries’ manufacturing, shipping, and disposal system perfectly mirror each other. However, reusing plastic bags as trash bags is a common recommendation of LCAs. And the UK researchers’ conclusions on the overall impact of plastic bags are similar to those drawn by other LCAs, such as those done on bags used in the U.S. and California specifically. There is a major factor missing from LCAs, though. Many of the places considering plastic ban bans are coastal areas—where plastic pollution is an serious issue. An estimated 8 million tons of plastic finds its way to the ocean each year, most of it from developing nations. And bags are among the most common types of marine plastic pollution. Both shore cleanup crews in California and researchers studying the effects of European plastic bag bans have seen a decisive decline in bags on shores and in the oceans, respectively, since their respective bans. Plastic in general has even been found all over the oceans, from that poor pilot whale’s stomach to the stomachs of shorebirds to the depths of the Mariana Trench. Scientists are still working out all the impacts, but what we’ve learned so far is alarming. “There is a growing body of experimental evidence that shows that there are some sublethal impacts on kidney and liver function—maybe some reproductive effects,” to the near-ubiquitous ingestion of plastic by marine animals, Anela Choy of the Monterey Bay Aquarium Research Institute told Earther. At the same time, trying to identify the origins—bags or otherwise—of this plastic is the “wild west,” according to Woods Hole Oceanographic Institute researcher Christopher Reddy. That’s because a huge amount of it exists as tiny pieces known as microplastic. According to the Scripps Oceanographic Institute’s Jennifer Brandon, the most common type of microplastic out there is polyethylene, essentially the same stuff our carry out bags are made of. Still, nobody can really say how much of our current microplastic problem comes courtesy of them. So, if plastic bag bans can reduce pollution, but leave us with bags that are less sustainable in other categories, what are we to do? Well, for coastal areas, plastic bag bans probably make sense. For everywhere else, it’s a bit more dependent on how much we reuse those reusable bags. As a general rule if you’re using totes, use them like hell. Sadly, some surveys suggest that people forget their totes on 40 percent of grocery trips. Others peg them as only getting used, on average, 15 times—a far cry from 7,100. What you can’t put in the totes, just put in plastic bags, and reuse said bags. Or, if you have a bike with a rack, get pannier bags, They double as totes. Plus, cycling to the store is better anyway.